Be sure and check out Tish Interiors profile and portfolio on Dering Hall. They were kind enough to feature one of my favorite rooms on Instagram too! I am thrilled that Modern Luxury selected me for “Faces of Design”! Harmonious Living by Tish Mills Interiors had a great time participating in the 2015 Home for the Holidays Showhouse. The current issue of Atlanta Homes & Lifestyles features the designers who participated and their spaces in the showhouse. In case you were unable to visit the showhouse, here are the images of our space and visit Atlanta Homes & Lifestyles online to see the others. Be sure to pick up a copy of the February issue of Atlanta Homes & Lifestyles!! "As consumers seek mindfulness and well-being as an antidote to modern day stresses, welcoming colors that psychologically fulfill our yearning for reassurance and security are becoming more prominent. Joined together, Rose Quartz and Serenity demonstrate an inherent balance between a warmer embracing rose tone and the cooler tranquil blue, reflecting connection and wellness as well as a soothing sense of order and peace." As many of you know, I always incorporate elements of feng shui into my designs. I also use a lot of natural stones and geodes to bring a sense of balance and tranquility into a space. That is why the 2016 Pantone selection spoke to me. Here are a few examples of my work where I have incorporated blushes and pale blues, similar to Pantene's colors of the year, in order to achieve a harmony and sense of order and peace. In the Home for the Holidays showhouse, I selected a pale, blush pink for the ceiling color. The adjoining bathroom is also pale pink. There are soft blues in the rug, the artwork on either side of the bed and in the window treatments. 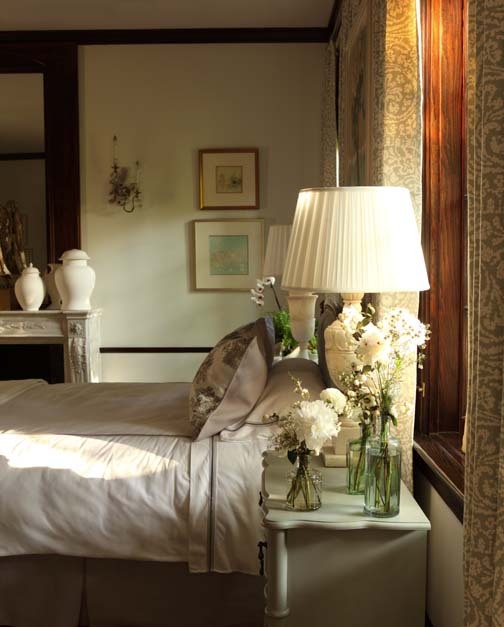 I also used crystal quartz obelisks on each bedside table. In my room at the 2014 Atlanta Symphony Showhouse, I used a tranquil palette of pale blue, blush, and lavender for a young lady's retreat. The chandelier is one of my designs using amethyst quartz. Be sure to pick up the September issue of Atlanta Homes & Lifestyles featuring the 2015 ASID Award winners. 2015 was Harmonious Living by Tish Mills Interiors "Sweet Sixteen". We were proud to accept our fifteenth and sixteenth ASID Awards, we took the silver for the following two projects. This chandelier and these sconces were designed for the Spa and Meditation Rooms in a past Christmas Showhouse. The stones used here are Rutilated Quartz, known to remove negativity from a space. The base of the chandelier is acrylic secured by leather straps. The wall sconce has a white gold finish. Tish became interested in stones and their meanings years ago and began incorporating them into her design. She buys specimens and geodes all over the world and uses them for lighting design and candleholders in all of her projects. Be sure to visit Steve McKenzie's where several different designs from B5b lighting can be purchased. You might not recognize this chandelier at first sight but it was the star of the dining room in our project recently published in Traditional Home. Tish Mills designed this agate chandelier with the client's fashion sense in mind. Tish chose agate and pyrite stones to create a chandelier to reflect the home owner's fashion sense. Mixed metals and stones are such a continuing trend so she chose the clear acrylic base to allow the stones and nickel stand out. Well, we did it again! I am so thankful for number 15 and sweet 16 ASID Design Excellence awards. 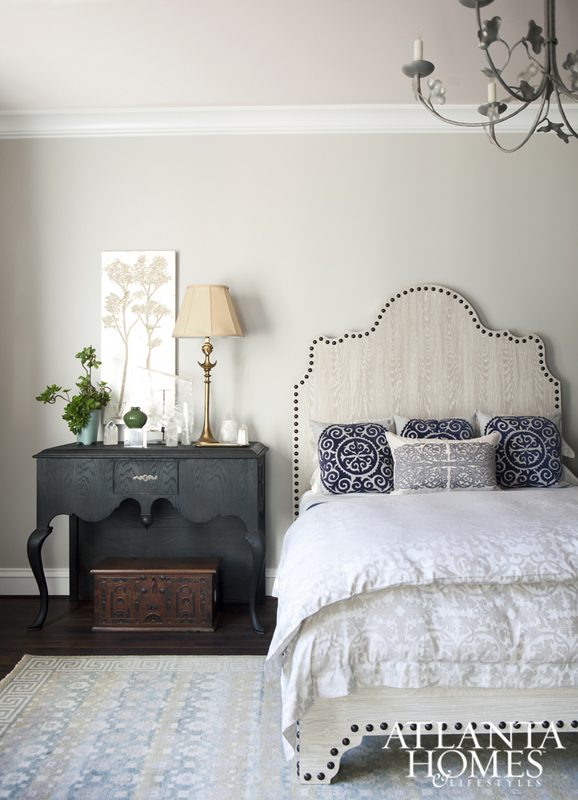 We just found out we were Traditional Home's pin of the day for this bedroom in their recent issue!! No, you are not seeing double, we made it two months in a row. A special thanks to a great client, a talented photographer and the wonderful people at Traditional Home Magazine. Here are a few of the pictures but you can look at "Bold Color Buckhead Residence" in our Portfolio or visit us on Pinterest to see it all. Tish Mills just completed a photo shoot of an Atlanta area project with Traditional Home Magazine. Stay tuned for more details. Harmonious Living Wins the Gold! Tish Mills was recently awarded another Gold ASID Design Excellence Award, this time for residential design of the Large Home category. This marks her 13th Design Excellence Award. Harmonious Living by Tish Mills welcomes Abbey Taylor. Abbey is the newest addition to the design team and has jumped right in on numerous projects within the firm. If you didn't make it to the 2014 Decorator Show House, take a look at this post by Ballard Design about our collaboration in the Young Lady's Retreat.